Although school has just begun for our largest class of graduates in the StreetSquash class of 2018, we have already heard some positive feedback from these brand new college first-years. One of these students is Kianna, an Ithaca College student looking to major in Psychology. Kianna also revealed her involvement in two clubs at Ithaca which partner with local middle and high school students for support and mentoring- sound familiar? 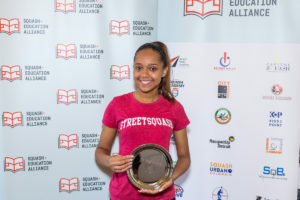 Although she is far from home, Kianna is using her StreetSquash experience to give back. We are so excited for what lies ahead on the journey through Ithaca College for Kianna, and for all of our StreetSquash alum completing their own journeys!